Where are all the Deliciously Ella recipes I hear you ask. Well – I have been making them – I just haven’t blogged them yet. This book is a tricky one for me. As are all the dishes I have made so far. The book is effectively a collection of blogged recipes from a lady that needed to change her eating habits to overcome illness. As a consequence Ella has had to cut out lots of good stuff. I admire her for producing a whole book with the limited ingredients she has at hand but for me I am struggling with the lack of punch or pizzazz that I like to get from the things that I make. Obviously this is going to put me in the doghouse with many people (especially those that love this book) but it isn’t working for me. This risotto really isn’t a risotto at all – even though it looks like one. If you follow the recipe to the letter it isn’t particularly tasty either. I found it quite bland. I pepped mine up with a squeeze of lime. I think some coriander and some creme fraiche might be a good addition too! To make it you roast some beetroots skin on, peel them once they are soft and blitz them in a food processor with coconut milk, lemon juice and seasoning. 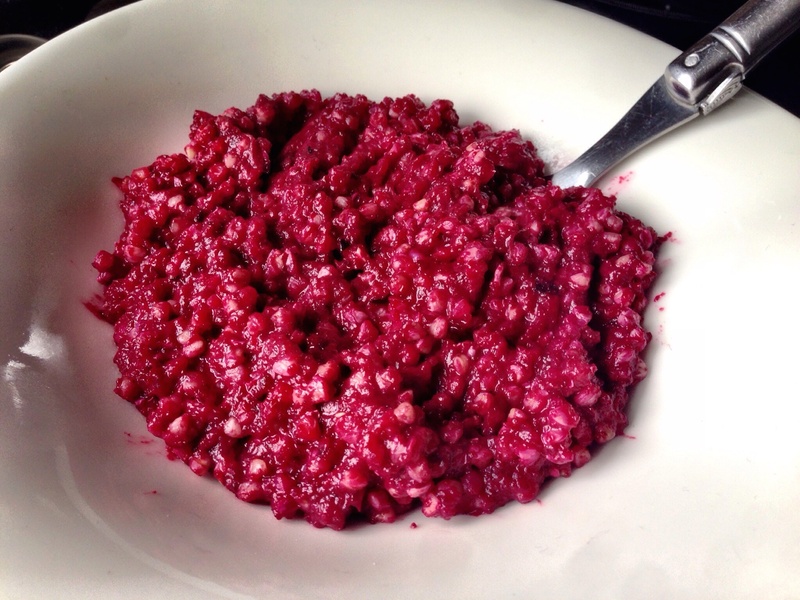 While the beetroot is roasting, cook the buckwheat until it is al-dente. Then combine the two ingredients and serve. It’s very easy to make and I absolutely guarantee it is good for you – just looking at the ingredients will tell you this – but for me there just isn’t enough flavour. I’ve made four or five things from this book now and the same issue exists with all of them. My tastebuds just want more – so I usually add something else to liven it up. That said Freya says she feels much better, less bloated and generally healthier this week – so this does seem to be having an effect. My experience in the past is that low fat or diet books (not that this is really either of those) tend to cut out so much that the food is dull. You just know it’s low fat and it leaves you wanting. Not that this should be a problem for most – it just doesn’t float my boat. One thing Hugh Fearnley Whittingstall, Hemsley and Hemsley and the Honestly Healthy girls achieved is both the light and health without sacrificing the great flavours and textures. For me this book falls down in this area. Don’t let that put you off. One man’s meat is another mans poison! Saturday was a day of plans. We had a long list of things to do – as always – and didn’t really get many of them done. Aside from catching up on sleep and not surfacing till well after 11am we didn’t really get going until after some particularly awesome bacon and fried egg bagels. Not the most healthy of foods but you have to treat yourself once in a while. After spending most of the afternoon tidying up the kitchen I set to making this awesome dish. I don’t really think you can mess this up. It takes time – but it isn’t attended time. You just have lots of baking to do – and waiting in the meantime. We spent the afternoon and evening watching Red Cliff. It’s a two part – 5 hours in all – Chinese epic by John Woo. If you haven’t seen it you should. If you end up watching the cut 90 minute version then sad times for you – you missed out on 5 hours of amazing cinema. This recipe is – you guessed it – also from Hugh Fearnley Whittingstall’s River Cottage Light and Easy book. It certainly is easy. Simply quarter and roast some shallots with some thyme in an ovenproof casserole until they are soft – almost caramelising. Add chestnut mushrooms, garlic and balsamic vinegar and roast some more. 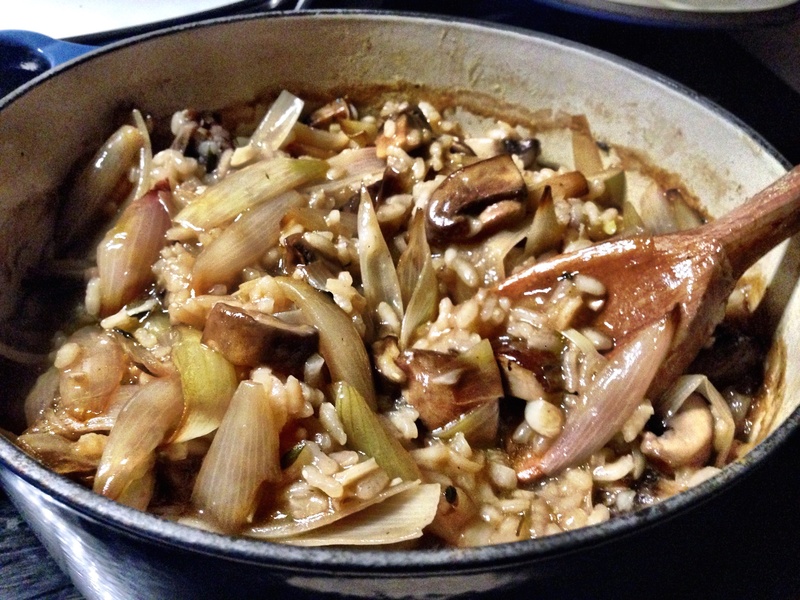 Finally add stock and risotto rice and roast until the stock has absorbed into the rice. It took about an hour for me. I have to say half way through I didn’t think it was going to work – but in the remaining 15 minutes all the stock got absorbed into the rice and it was a gorgeous gloopy consistency just like a proper risotto. You’ll note there is not cheese or dairy in this at all. It’s very healthy indeed. There’s only a tablespoon of oil in the whole thing! And it tastes just as good as any risotto you’ll eat. There’s a serving suggestion of drizzling chilli oil over it – but we didn’t bother with that. I didn’t have any – didn’t want to make it – and decided that Freya might not enjoy the chilli addition. As easy dishes go, this really is. Barely any washing up. Essentially a one pot dish. 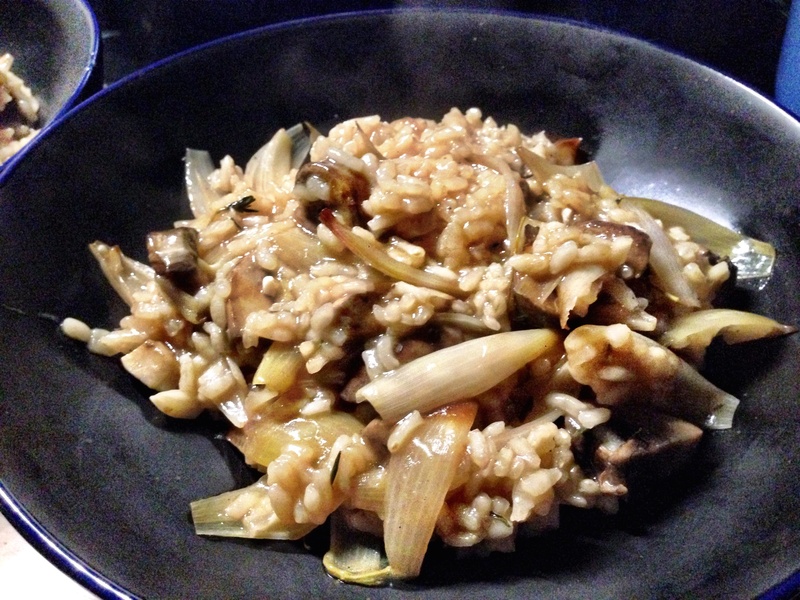 One knife quartered the onions and chopped up the mushrooms into large chunks – but that’s it. A very tidy dish. I’ll certainly be making it again. I’ve made this twice now. And I know I will just keep making it. It’s quick, easy, tasty and I always have the ingredients to hand. On top of that it makes lots so there are always leftovers for work the next day! 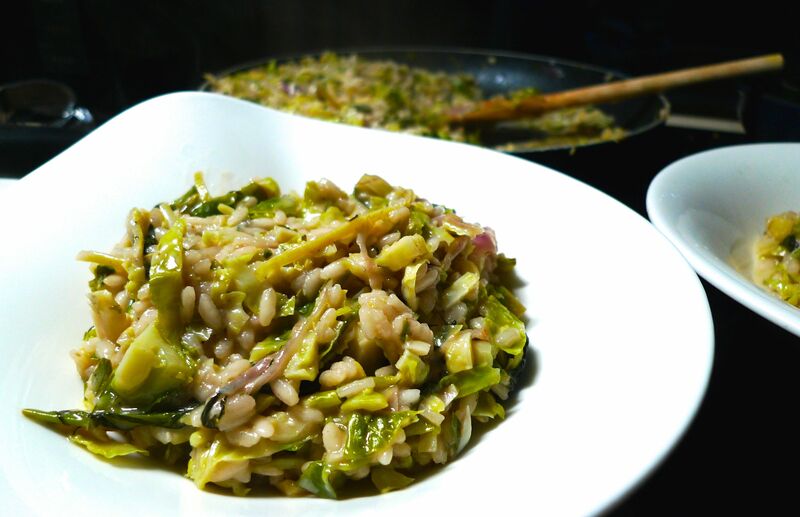 Tell someone you are making Brussels Sprout Risotto and they are sure to turn their nose up at you. Freya’s brother did. I could see his mind whirring at how he needed an excuse to leave so he could pop into McDonalds and get some real food! But trust me this is worth it. The Brussels that Ottolenghi has in the pictures in Plenty More look stunning. Straight off the stalks with lots of purples and dark green colours running through them. I had to settle for the boring light green pretrimmed variety from the supermarket. I’ll try and hunt down the colourful ones nearer Christmas; I think the dish will look super special with more vibrant colours. 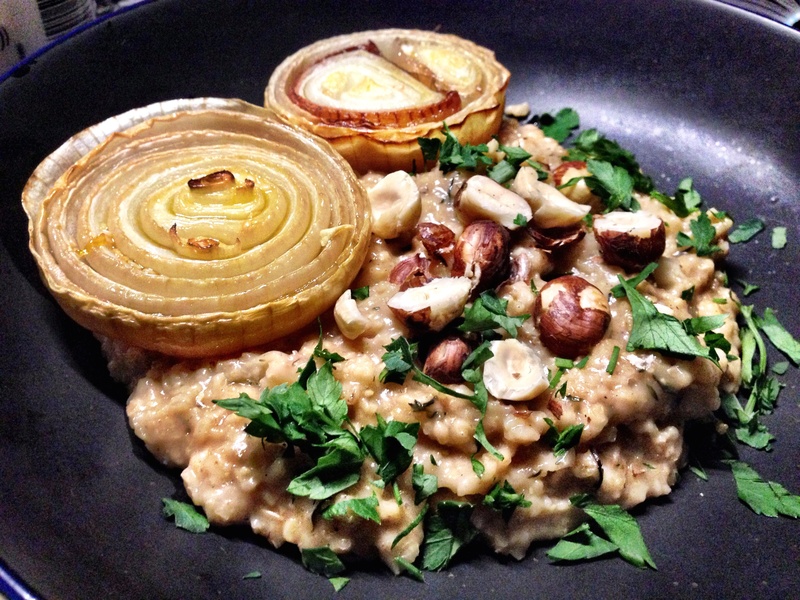 You make the risotto by frying some onions in butter and oil and then adding lemon, garlic and thyme. While that is caramelising, shred your Brussel Sprouts. I must admit I made it wrong this time. You’re supposed to shred about half the sprouts and quarter the other half but I wasn’t paying too much attention and added all the sprouts and the rice to the onions at this stage. The idea is you pan fry the quartered Brussel Sprouts in hot oil until they are golden and crispy and add them as a topping at the end. I’ll try and remember this for next time! You now make the risotto as you would any other risotto; add wine and let it absorb and then gradually add stock while stirring often. When the stock is all used up the rice should be cooked but still have some bite. Right at the end add Parmesan, Dolcelatte, tarragon and some grated lemon zest. if you followed the recipe properly, add the pan fried Brussels on top and serve. It’s just as good with all the Brussels incorporated it just doesn’t look as striking – and it removed a crunchy texture that could have made the dish even more special. This risotto is so creamy and is really tasty – especially with the additional lemon zest that I added. There was so much of this left over that we had it for lunch the next day. I don’t think we were especially popular in the office later that day. Two Brussel’s Sprout meals in a row!